Some upgrades do get more work done faster, while others just make work more pleasant for you. A bigger monitor may be just what your tired, watery eyes need. A more ergonomic keyboard or mouse is another comfort upgrade; not that comfort doesn’t improve performance, but it’s mainly the comfort that counts. Twenty years ago, I was diagnosed with carpal tunnel syndrome. My doctor suggested both drugs and surgery, but switching to an ergonomic keyboard with the split/curved key layout completely eliminated my pain. When I type on a "regular" keyboard (the cheap, rectangular ones that usually come with new computers) I feel that familar wrist pain again. Amazon has a selection of 24-inch monitors (rated 4-stars or higher) starting at $89.99. This Sceptre 24-inch LED Monitor has both HDMI and VGA Ports, Full HD resolution built-in speakers, and tiltable stand. If you want something larger, this Dell D-Series 31.5-inch monitor is on sale for $164 with free shipping. Two of those would make an awesome dual-monitor setup! Here's one zero-cost option for speeding up an older computer. Consider moving away from Windows, and switching to the Linux operating system. Linux tends to require less in the way of hardware resources, so it can be a good option for older computers that bog down with newer versions of Windows. See my article A Free Windows XP Alternative for some practical "how to" advice on switching to Ubuntu Linux. AskBob readers have also mentioned Linux Mint and PCLinuxOS as Linux versions that have a familiar Windows-like interface. A rule of thumb is that general home users need a minimum of 4 GB of RAM; business and power users, 8 GB or more; and only the busiest video editors, database administrators, or gamers need 16+ GB of RAM. But modern versions of Windows can work with up to 2 TB (terabytes) of RAM memory. The operating system you have is very important when considering buying RAM. 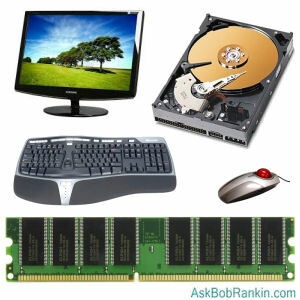 See my article Will More Memory Speed Up Your Computer? for more tips on upgrading your system's RAM memory. Increasing the size, thoughput and access speed of hard drive storage is a tempting upgrade option. A traditional magnetic hard drive that spins at 7200 rpm is much better than one spinning at 5400 rpm. Solid-State Drives (SSDs) are the bleeding edge of mass storage technology, but they are still expensive compared to magnetic hard drives. But here's something to consider… right now, a 1 terabyte (1000 gigabytes) magnetic hard drive costs about the same as a 256 GB SSD drive -- roughly US$50. But if you've only got 100 GB of data, the SSD is obviously a better buy, even though it holds about one fourth as much data. If you're thinking about a new hard drive because you're running out of space to stash your stuff, first try a little spring cleaning, and see how many gigabytes of garbage you can eliminate. Unwanted software, temp files, and duplicate files can chew up a lot of space. A careful pruning of music, photos, and video files may yield big gains as well. See [FREE] Tools to Tune and Optimize Your Hard Drive for more tips and free software you can use to get the job done. A word about Windows 7 seems appropriate here. You may have read articles in the tech press that Microsoft will end support for Windows 7 in January 2020. If you're running a computer with Windows 7, that does not mean that it will stop working next January 14th. Nor will you be forced to upgrade to Windows 10 at that point. It does mean that you will no longer receive Windows updates for security issues that arise after that date. Probably. Microsoft has extended these "end of support" dates in the past, but there's no guarantee they will do so. When the end of support for Windows 7 does arrive, you'll need to decide of you want to stick with a 10-year-old operating system, or move to Windows 10, which is arguably more secure. If, between now and then, you end up retiring your old computer and purchasing new, your choice will be made for you. Most recent comments on "The Best Upgrades for Old Computers?" @Ken Heikkila Yes, we all know Bob is a big Windows guy as well as a Google guy. That doesn't mean he can not write about other products. If you have been here a while you would have noticed Bob has discussed Linux and Android in previous articles. I am not a Windows user and still find these posts interesting, Also, I do agree with the others that Linux should be mentioned. One good example, I have an Acer Netbook which at the time of purchase I paid extra to have the 1GB RAM upgraded to 2GB. It came with XP. Near the end even XP really bogged down the system. I put Ubuntu on the Netbook and it was revived. With Ubuntu 16 release, the system started to bog down again, so I changed the OS to LinuxLite. The Netbook is still kicking and being used weekly. Yeah, and Windows 10 has a "back door" built in to it which is why some geeks don't want Win 10 and are moving towards one of the Linux variations out there. Bob, upgrading an old computer really isn't difficult, especially a desktop. A laptop is another story. But the major issues of upgrading are: 1, what programs are on your current computer: 2, have you backed up your data so you can restore, then backed it up again in another location. - Remove all the crapware if the OEM OS restore brought it to you. - Run a good, known, supported AV and antispyware. Just my $.02 on this. EDITOR'S NOTE: You won't get any such link. At least not one with any credibility. You hear these "XYZ has a secret back door" comments about lots of products -- operating systems, browsers, anti-malware, encryption, etc. It's the stuff of myth, legend, and in some cases, deliberate deception. I initially did the free upgrade to windows 10 on my duplicated win 7 drive tried it for a while but didn't like it so swapped back to the win 7 one.I still have the drive with the win 10 on it but it has never had any updates done to it. I'm not looking forward to loosing my win 7 and having to go to win 10,but I suppose sometime or other will probably have to as my laptop is from 2008 and by today's standards straight out of the ark.I have done some repairs and reinstalls for a friend on his(originally 8.1 to 10)but still don't like it as much as win 7. I too took an old laptop that barely functioned and put Chalet OS (linux) on it. It looks just like windows and I now can use it to stream and play media. All for free. We have 3 computers with Windows, two adroid tablets and two android phones. Now we the linux machine we have succeded in avoiding anything Apple. For what it is worth I have a slightly different take on Linux. Install Linux Mint and dual boot with your current Windows O/S. Use Linux for your internet activity as it is quicker than Windows and is safe from Windows specific malware. The result is you have a modern operating system (Linux); and access to your favorite Windows programs. @James. Thanks for telling us in detail what you order from HP, BUT the point of th article was how to upgrade a computer. So, what is the first things you upgrade on your selected HP? BTW, where is the back-door info on the tease you threw out there? I have a Toshiba laptop 10 or 11 years old with a 17 inch screen. When I was elected treasurer of our hospital auxiliary and installed Quickbooks on it, it slowed right down. Quickbooks is a resource hog. I installed a 1TB SSD and 8Gb of RAM and it's now more than fast enough, even running Quickbooks. It came with Win 7 and now has Win 10. Linux! My old XP and Vista machines do everything I need, free. I run Mint. Very good points worth to consider because older computers are more designed to last than new ones. However,, as to my knowledge its more difficult to upgrade a laptop. Probably Bob can show us options to do so. The machine I'm using right now is a dual core Dell Latitude D520 laptop that began life with Vista Ultimate. It really struggled even after upgrading to 4GB of RAM and a 7200 rpm hard drive, often taking 10 to 15 minutes just to boot. It couldn't even play YouTube videos. Consequently, it sat unused on a shelf in the closet for more than two years! One day, when faced with potentially buying a new laptop for the family, I had the wild idea to upgrade the OS. It's amazing how well this old laptop runs under Win 10 Pro! I couldn't believe it was the same machine. I have attached a 2nd large monitor and use this setup daily for all sorts of things. I have 24 tabs open right now in Chrome with only 7% CPU and 69% memory use. One upgrade - GUARANTEED to speed up the start process - is moving your OS to an SSD. You can add a small SSD drive, or swap out the magnetic hard drive. It will speed up most of your regular programs as well. Now you will boot and compute as fast as --- most Chromebooks, which only have SSD drives. That is their real performance secret. If you want a computer, that does more than surf the net or stream video, the SSD upgrade is great. I claim to be dragged kicking and screaming into the future. That said, a few years back I tried Win8 and went back to 7. 8.1, on the other hand, seemed to be more useable and only got better. I am now running 10 on my machines and would not go back, even though some antique software either works poorly or not at all. Also, my experience with alternative OS's has been that if the old PC has trouble with newer Windows it will generally not work all that much better with Linux, etc. The developers take advantage of newer hardware, just like Microsoft does. An SSD definitely is a speed improvement, especially to boot-up. Finally one of my favorite subjects. I love to upgrade old Laptops and PC's. SSD's and more RAM usually do the trick. I actually have a Dell Latitude D610 running Windows 10 Home 32bit, that was a real challenge, new processor, more Ram and a 7200rpm 100GB IDE HDD. PC's are easy because you can always slap in a Graphics Card along w/RAM and SSD. I have "OLD" Laptops that I will put up against newer models, they all boot in under 15 sec. Lenovo T420 i5,8GB Ram and 256 SSD, Dell XPS M1330 Dual Core T7500 w/128MB Graphics, 4GB RAM and 256 SSD and my Dell Latitude D630 Dual Core 4GB RAM and 256 SSD. Believe me when I say they don't make them like this anymore. This is being written on a desktop made in 2002, so yes, old computers can be kept functioning usefully. Regarding hardware, RAM on this device has been expanded to the maximum (a heady 2GB), and two new larger hard drives have been installed, one for the OS, the other for data. Choosing the right browser is very important with old computers. An old browser will give patchy and insecure web access, while a new browser may be too heavy or not support the OS. In general, I have obtained the best results with Pale Moon, a stripped down fork from Firefox. This no longer supports XP, but there is a variant, MyPal, which adapts new issues of PM for XP users. A good ad-blocker is also essential for browsing the web with an old computer, as modern web-sites are frequently very complex and access many other domains, including social media, while loading. This can mean that the site will load very slowly or not at all on an under-powered machine. I use uBlock to restrict this activity and enable sites to load more quickly. Web browsing can also easily grind to a halt, particularly on old machines, when too many tabs are open. My solution for this is to use another add-on (LullMyTabs) to unload (not close) tabs which are not in use after an interval, which can be set to, say, 8 minutes. Tabs which need to kept open can be excepted. It is well-known that there are ways of still getting security updates for XP. The anti-virus program on a machine of this kind must also be light and compatible with the OS. My choice, Panda Dome (formerly Panda Cloud) still supports XP, is free, and refers signatures to "the cloud", so it does not need to burden the computer with this processing or a stream of definition updates. When modified and used in this way, a Pentium 4 can still do useful work. It is interesting to note that processor speeds have not increased substantially since this class, so this is not an issue, although naturally only having a single processor will be a limitation for many users. I see my comment about upgrades has been associated with another ""James"" about a Win 10 backdoor. that's not me. These articles from BOB contain many, many opinions which provide information to be able to make an informed decision. I can only comment on what I do and how I do it. I love all the info that's provided by BOB's readers.